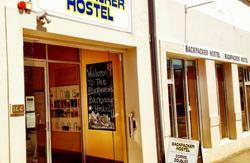 We are a small friendly Backpackers known for our unique atmosphere, 5 min walk from Katoomba Station and close to the start of the spectacular Blue Mountains World Heritage Listed walks. We are passionate about this beautiful part of the world and look forward to sharing with you our knowledge on the many walking tracks and climbing routes in the area. At the Flying Fox guests are encouraged to minimise their impact on the environment, to tread lightly on this beautiful part of the world and to enjoy. If you are an independent traveler looking for something a little different visit us today. 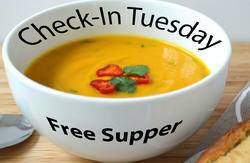 We offer free breakfast, free Wifi, free maps, and a free pick up service. At the Flying Fox you will enjoy a relaxed mountain atmosphere. Sit by the fire in our lounge room at night and make new friends while enjoying a cup of free Gluhwein or Mulled Wine and some free Tim Tams to dunk in your Tea. We often have free home cooked pasta nights with home made or Italian breads. Appreciate the original artwork and soak up the atmosphere. Free DVDs, free WiFi, free book exchange and musical instruments, including didgeridoos, are available for you to try your hand with. We also have a camp fire each night for a couple of hours outside in our courtyard/ hut area. Included in your price is a great free breakfast including Italian bread, honey jam, and a choice of cereal. Tea coffee and milk are provided all day, and we provide espresso coffee makers and free ground coffee! If you don't feel like cooking while in the mountains you can try some of the best coffee in the world in Katoomba. Katoomba is coffee crazy! Pop down to one of the many great cafes and chat with the locals. If you would like assistance with hiking trails please ask. We provide free maps for our guests on the areas around Katoomba, Leura, Wentworth Falls and Blackheath. We walk the trails ourselves we are happy to share our knowledge with you. The owner is a keen mountain biker who loves to help out anyone intending to take on the mountain trails. Experience amazing local galleries in the Blue Mountains. Many are within easy walking distance from the Flying Fox. 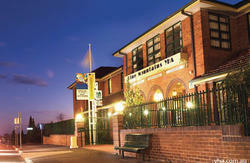 We are situated 350 metres from Katoomba railway station. When you get off the train, walk up the steps into town. Cross at the crossing and walk to your right. Walk along Main St , cross at the roundabout . You are now on Bathurst Road and we are just past a fruit and vegetable shop, Todarello's. From Sydney turn left on Great Western Highway at The Town Centre traffic lights. Cross railway bridge and turn right at the roundabout. We are 300 meters from the roundabout(just past the fruit and vegetable shop).